Posted May 9, 2018 by Jade Morellini & filed under Featured Inner West Independent, Inner West Independent. NSW Planning approved Stage 3 of WestConnex despite receiving formal advice from the NSW Environmental Protection Authority (EPA) that a more detailed environmental assessment of its impacts on the community was needed. Along with other government agencies, the EPA was given a final opportunity to respond to the NSW Roads and Maritime Services’ Preferred Infrastructure and Response to Submissions Report (SPIR). The purpose of the SPIR was to respond to thousands of criticisms of the Environmental Impact Statement (EIS) for the Stage 3 proposal to build a tunnel between St Peters, Haberfield and Rozelle. In a letter to NSW Planning in February this year, EPA Metropolitan Regional Director Ms. Giselle Howard acknowledged that RMS had addressed some concerns raised by the EPA in its earlier rejection of the EIS, but went on to explain that the agency “reiterates its previous advice that all impacts be “assessed in detail during the Environmental Impact Assessment rather than under post-approval management plans”. The EIS was limited to a broad assessment of impacts of a ‘concept’ for which no detailed engineering solutions or designs are available. The concept includes a three-layered underground interchange at Rozelle of a sort that has not previously been constructed anywhere in the world. The approval requires a number of post-approval plans before construction begins but these rarely involve detailed environmental assessments and will be approved without any input from community stakeholders. Many plans are regular ‘tick box’ exercises. I received a copy of the EPA’s final advice through the EPA media’s office on Tuesday May 8th. I made direct inquiries after I was told last Friday by a NSW Planning staff member that she had confirmed that the government departmental responses to the SPIR are never released and would not be released in this case. Following this advice, I wrote to a senior Planning Department officer Mary Garland, enclosing a link to where government responses had been published for the New M5 and requesting that the responses of the EPA and other agencies be published on the Planning website. I have neither received a response from Planning, nor have the agencies’ responses been published. The Department’s failure to post the agencies’ responses follows the Minister for Planning Anthony Roberts’ secret approval of the Stage 3 EIS on April 17th. Mr. Roberts did not release his decision until the afternoon of Friday April 27th, and was then not available for comment. In a planning system with even minimal accountability and transparency, one would expect such critical assessments by the government’s own agencies to be public and open to further assessment. Normally, a conflict between government departments would trigger caution and further assessment. It is perhaps a sign of increasing fragility of the government’s position on WestConnex that it has attempted to delay the release of the agencies’ responses. The EPA’s reservations are in addition to scores of criticisms in independent peer reviews commissioned by NSW Planning that have been posted on the department’s website. These peer reviews unbelievably include findings that traffic congestion levels would be at ‘saturation’ point in St Peters and queues would back up into tunnels at Haberfield if the planned projects are completed. By then somewhere between $20 and $45 billion will have been spent on a solution that was supposed to be about solving Sydney’s traffic congestion. The EPA’s criticisms of the NSW Planning approach to WestConnex’s planning decisions reinforces the position of groups campaigning against WestConnex, that the approval is so flawed that it lacks legitimacy. At a protest outside NSW Parliament on May 1st, City of Sydney Mayor Clover Moore, Deputy Mayor Jess Miller, three Greens MPs Mehreen Faruqi MLC, Balmain MP Jamie Parker and Newtown MP Jenny Leong, Inner West Independent Councillor Pauline Lockie and Waverley Labor Councillor Marjorie O’Neill ripped up giant facsimiles of the approval to loud cheers. Although it has not previously rejected a WestConnex EIS so clearly, the NSW EPA has made many criticisms of previous WestConnex EISs. It criticised the lack of time it was given to respond to the M4 East EIS and complained that there were “outstanding issues” with the air quality assessment that had not been addressed. In its response to the New M5 Response to Submissions, it again argued that the RMS’s EIS consultant AECOM had not “comprehensively” or “transparently” addressed outstanding problems with the air quality assessment. Global consultancy firm AECOM, which has been responsible for the EISs for the M4 East, New M5 and M4/M5, has never been required to respond to these criticisms. It was involved in the original planning and promotion of WestConnex and has commercial interests in the project. It is never available for comment as it regards all its WestConnex dealings as ‘commercial in confidence.’ On the other hand, it has recently worked for both RMS and NSW Planning on contracts for other projects, which highlights the lack of independence in the WestConnex planning process. The EPA carries the responsibility of ensuring WestConnex complies with environmental law and its licences but it cannot halt work when persistent breaches occur; its powers to do so in relation to declared ‘state significant infrastructure’ projects were removed in amendments to the NSW Planning and Assessment Act, passed by the LNP government in 2012 before WestConnex began. This result was that when overpowering odours repeatedly spread over St Peters and nearby communities in 2017, the EPA was unable to order work to stop. Last week, the EPA initiated a prosecution against CPB Contractors Pty Ltd (previously known as Leighton Contractors) in the NSW Land and Environment Court for allegedly causing offensive odours from WestConnex St Peters interchange site on four occasions in 2017 in contravention of section 129 of the Protection of the Environment Operations Act. A contravention of section 129 can only attract a maximum penalty of $1 million for a corporation. In December, CPB Contractors’ WestConnex New M5 ‘s major subcontractor Metropolitan Demolition and Recycling Pty Ltd pleaded guilty to providing false information to the EPA in relation to a diary, which was allegedly used to “avoid RMS fees by underreporting overloaded trucks.” During the demolition of scores of residential and industrial buildings in St Peters in early 2017, residents laid many complaints against Metropolitan Demolition and its sub-contractors for unsafe removal of asbestos and failing to control dust. WestConnex refused to supply the names of subcontracting companies on the ground that their identity was confidential commercial information. Last week, Fairfax Media’s The Age reported fresh evidence that staff of Leighton Holdings (now CIMIC, the owner of CPB Contractors) had been engaged in corruption over offshore contracts up until 2012. Age journalists Nick McKenzie and Richard Baker wrote that the scandal was notable because, despite a substantial amount of evidence, the Federal police have not yet charged a single individual. CIMIC, which has already received $4 billion worth of WestConnex contracts, has been reported to be involved in bidding to buy 50.1% of Sydney Motorway Corporation that controls WestConnex. A CIMIC subsidiary CPB contractor is also shortlisted for the contract for the WestConnex Stage 3 mainline tunnel between St Peters and Haberfield. Meanwhile, the NSW Labor opposition last week released a secret letter between the New M5 CPB Dragados and Samsung consortium and Sydney Motorway Corporation which revealed that the contractors are claiming an extra $706 million to cover cost blowouts. The New M5 project, which was originally supposed to be completed in 2019 and then 2020, is now likely to be opened in 2021. Leighton was involved with AECOM in the failed Brisbane toll road project Clem 7. After that collapse, AECOM paid more than $400 million in settlements for damages for making misleading traffic projections. 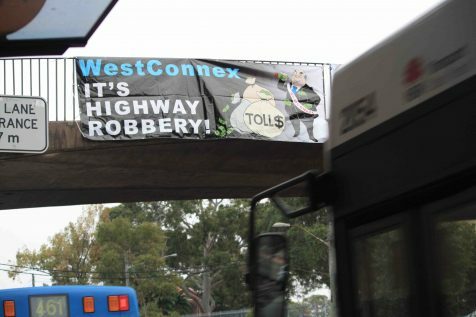 There is widespread opposition towards WestConnex, including its unaccountable planning decisions and onerous decades of tolling. But as no hearing or appeals are possible against approvals, only political action, the collapse of financing or the privatisation deal or an inquiry exposing corrupt or secret dealings can now stop Stage 3.